In the blink of an eye I have found myself caught up in a tornado of blow driers and an ever-present cloud of hair spray. I feel like Dorothy being thrown into an unfamiliar salon-version of Oz. I recently started my very first internship with Andre Richard Salon and I couldn’t be more excited. I can’t wait to put my PR skills to real-world use. The problem is, while I know a good deal about public relations, I know absolutely nothing about salons. 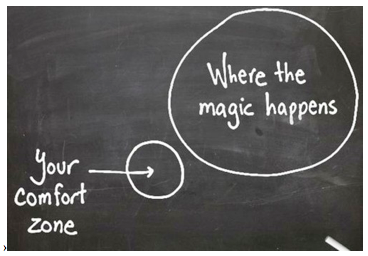 College is the perfect time to step outside your comfort zone. There are so many opportunities and paths to take it is almost impossible not to. This internship is a pretty big leap outside of my comfort zone, but it is a leap into a lot of learning potential. I am going to learn the ins and outs of the salon world, products, and styling—and how a PR pro maneuvers through it all. I’ve only been working at the salon for a few weeks but I have already learned a lot. Having a wide breadth of knowledge will only make you more appealing to future employers. Taking that step outside of your comfort zone is the way to gain more experience and more knowledge in an area you might not have considered before. So join a new club, apply for a long-shot internship or job, or take a class outside of your major just for fun— you never know what it might lead to.